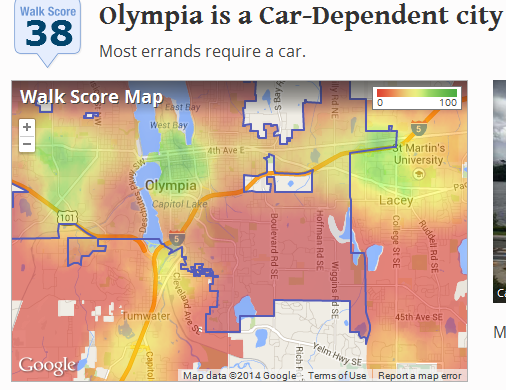 Olympia Time: "We've now got TONS of houses and nowhere to walk"
"We've now got TONS of houses and nowhere to walk"
Read the results of the new Olyspeak.org survey. It is fascinating to read people chatting about what kind of things they like to see in a "community center" in their neighborhood. Hopefully, the new comprehensive plan moves our neighborhoods into creating more of these vibrant areas. Think of the Wildwood building on Captiol Way, the Co-op on the west side or the San Francisco Bakery on the Northeast. Or the desert of any sort of walkable community on the Southeast side. At least on my side of town, there has been some serious real politics dealing bad news to this sort of thing. In my neighborhood, Briggs Village, the developer seriously dialed back what on paper was supposed to be a pretty impressive urban village. Some apartments over commercial. Some multistory commercial. Maybe even parking basements. But, now we're likely going to get a shiny strip mall sort of thing. Hopefully, it turns out okay. But, in the long term at least, it was supposed to be a move to develop the area quicker. For now, we have no movement on those lots yet. A few miles away, the LBA area was supposed to see a similar development with a nice walkable commercial/community area. But, neighbors to the proposed development rose up and stopped it. Ironically, those very neighbors live a massive wasteland of walkable community areas. Between the Pit Stop Market (on 18th) and the Chevron on Yelm Highway, there is literally no place to buy a gallon of milk on foot for thousands of Olympians. We want community. We want places to walk. We want to have tight neighborhoods that are forward facing and nice. We want character. But, developers dial back grand plans and suburban car house dwellers defend trees in the face of new diverse neighborhoods. However we advocate for neighborhood centers needs to realize the real politics that have created acres and acres of houses with nowhere to walk. I agree with the gist of a lot of your comments, having lived near LBA for many years. But there were actually two proposals. The DR Horton development would be horrible in all respects, and that property is actually the most natural choice for a park extension from an ecological point of view. The planned community with retail space was going to be called Brentwood, I think, and it was to be on the south side. As a parent, I would have loved to have had a little community retail center there. I would have felt sad for the bats living in the trees, though, as I felt sad for the birds losing their orchard on the Merryman property.